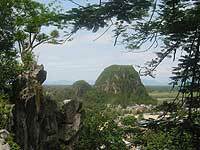 The more prosaic Vietnamese name for the Marble Mountains is Ngu Hanh Son (Five Elements Mountains). The five peaks consist of limestone in different hues and overlook the East Sea 8km from Danang. Emperor Gia Long, founder of the Nguyen dynasty and builder of Hue’s Citadel, decreed that the five mountains named after the five elements of nature: Kim Son (metal), Moc Son (wood), Hoa Son (fire), Tho Son (earth), and Thuy Son (water). The small range is probably a fragment of a much larger limestone karst system that has decayed over untold millennia. Thuy Son is the largest, and considered the most beautiful, of the five mountains. It’s actually three peaks covering around 16 ha and, like its smaller neighbours, is riddled with caves and grottoes, many of which house shrines and sometimes complete pagodas. For visitors, its highlight is the Ling Ong Pagoda, a shrine within a cave. 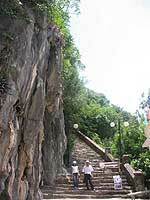 The Marble Mountains are an important historic and religious. Their archaeological and architectural values are significant. Unusually in Vietnam, several pagodas pre-date their names by several centuries. The Tam Thai pagoda, for example, was built in 1630. There are Champa sculptures from the 14th and 15th century, and several of the Vietnamese stone and bronze statues in the caves are more than three hundred years old. The tradition of stone carving continues in villages at the feet of the mountains. 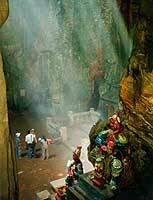 During the years of feudalism, the Nguyen Lords stored their gold and jewels inside the Marble Mountain to be looked after by the monks who guarded many the passages inside the caves. In those days, the villagers of Nui Kim Son manufactured jewellery both for the warlords and to sell commercially. To ensure security, they never married outside the village. Gradually, a belief grew that large amounts of gold and jewellery were hidden inside the labyrinth of caves and passages inside Nui Kim Son. The monks are long dead, and their secrets with them. The French military built bunkers on the mountains, and the Viet Cong used the caves as sanctuaries for the Viet Cong during the American war. At the same time, the US forces built observation posts and artillery platforms high on their peaks. The mountains' high-grade limestone is quarried to support local sculpture businesses. Workshops and factories in nearby Hoa Hai village produce marble sculptures and stone furniture. The industry began many centuries ago - some of the locally produced steles in Quang Nam Province's ancient pagodas date back to the sixteenth century. Originally, the products were votive or commemorative items, but today's craftspeople now feed a thriving domestic and export market. The Marble Mountains are well worth a visit, but there are some disadvantages. Visiting most of the significant caves and shrines involve a steep climb up mostly rough steps that can be slippery in wet weather. However, the main downside is a posse of aggressive hawkers and would-be guides that descend on tourists as soon as they appear. They are often young children and are annoyingly persistent. If you travel with Haivenu, your guide will deal with the problem! We are committed to direct the tourist dollars into local people's pockets as far as possible, but most of the goods and services on offer are a rip-off targeted at unwary visitors and tarnishing our country's image. A minority of the people with a hand held out are deserving causes with no other means of support - elderly widows, Buddhist monks and nuns, amputees, for example. Your guide will advise you.